This entry was posted on November 13, 2018 at 10:39 pm and is filed under American History, European History, USA. You can follow any responses to this entry through the RSS 2.0 feed. You can skip to the end and leave a response. Pinging is currently not allowed. If to follow this logic, Columbus no, spirit of exploration no, European civilization no, modernity no, science no, modern medicine no, to remain in cave culture, YES. Back to cave culture? They were already imperialistic, and dislodging, even exterminating the Natives! Prehistoric men grabbed the caves from CAVE BEARS. Neanderthals dislodged the fabulous cave bears! Imperialism, colonization, a scandal! The essence of the human project is colonialism, so says history. Thus the unreals condemn history, and execute it! America is deeply divided. The blue state cities will take down certain statues, but there is nothing stopping red state areas from putting up statues of their heroes. So, relax. It’s all good! I am relax… as far as the red/blue struggle is going. But we need the white of surrender, too. The drive to take down Columbus statues is coming from Native Americans. The drive to take down Confederate statues erected during the Jim Crow era is coming from blacks who know the statues were erected well into the Civil Rights era as means of telling black people that whites would never accept them as equals. In both cases, white liberals agree as they too do not support memorializing genocide and slavery by any group, Spanish or Anglo-Saxon. The only people attempting to defend and protect the legacy of Anglo-Saxon genocidal mentality are Trump himself, and his RedState bible-thumping, plutocracy-supporting base. With regard to Islam, I agree with you that PC liberals are acting stupidly when they condemn people who rightly fear (Islamophobia) a religion that calls for mass murder in its holy texts. I am phobic towards all three of the genocidal Abrahamic religions. Statues to Columbus were raised not celebrate genocide but as a symbol to the beginning of western civilization in the Americas and the two great countries (the United States and Canada) that came from it. 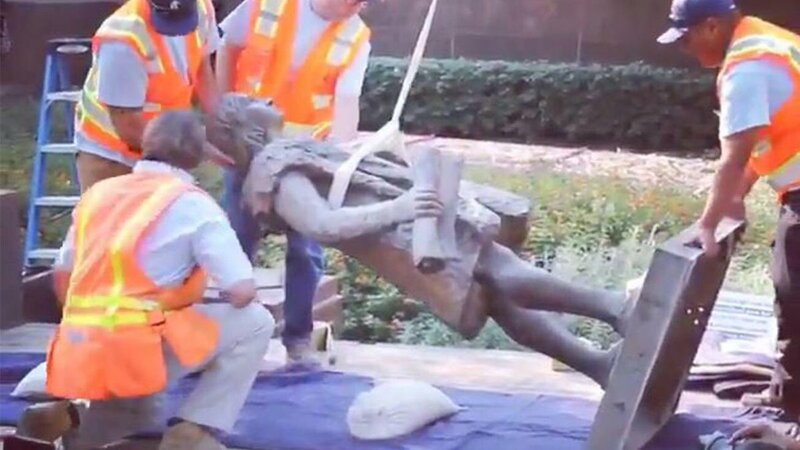 The drive to take down Columbus statues is coming from anti-civilization, anti-western pseudo-progressives whose only impulse is to attack, destroy and replace the Anglo-Saxon Protestant tradition, a tradition into which immigrants from diverse backgrounds were once readily assimilated, which enabled this country’s successes. Welcome to the American cultural revolution. BTW, there is even a famous map, old at the time of Isabella, who showed the Americas. Although the Vikings and Basques fishers tried to say as little as possible, there were indices, like the Inuit who paddled to Scotland…. Agreed 100%. The movement of taking down Columbus, is anti-civilization, even anti-history, in the hope of making the race to the bottom, learning-nothing, into the highest principle… There is no race, but the race to the bottom, and they chuckle. Patrice, your response does beg the question: What would the state of Central and South America be today if it had been colonized not by the Portuguese and Spanish, but by the British and the French. I was shocked by your question, and felt like replying with a non sequitur, like “beats me”. However, then I remembered that the answer was obvious. South and Central America would be probably more advanced, a gigantic USA. Before the PC crowd start screaming my way, let’s remember that Spain stayed under the Inquisition until mid 19C. One can even see the Spanish Civil War of 1936, not just as a Nazi event, but also a return of the Inquisition. By the 1600s, Portugal was actually invaded controlled and occupied by Inquisition Spain. Philippe II, a generation before, had sent an entire armada to annihilate, down to the last baby, the French settlers of the “Carolinas” (so named by the French) in present day US…. The French colony problem was it was the mildest and most axed around FAIR TRADE. That’s why the French lost Canada and Louisiana (most of North America! ): the West Country Men preferred to line alleys in Ireland, with human skulls… But the Inquisition was worse. Confederate statues is another matter, entirely. Those were genuine racists and enslavers. Nothing to celebrate. Whereas Columbus was out there for exploration and trade (we know this, he married into a family of prominent Portuguese maritime explorers, and used their notebooks; the Portuguese pilots knew there was land to the west of the Azores… With different people and different trees…). There is a place for statues of the uglies… Like there are some for T Rexes, though… For example, although no an admirer of Hitler, just the opposite, I hold that forgetting Hitler happened would make sure he would be back soon… Not to say Hitler, Marx, Stalin, Lee statues should stand for admiration, but maybe statues of the uglies should be parked in a park of the uglies! The book “Euclid and Jesus” by C.K. Raju deals with how and why the church changed mathematics and and Christianity across two religious wars. Hypatia was lynched by the Church and attributed the Elements to Euclid with no evidence. Read the story in the book available from Amazon. The Church has been manufacturing lies all through history. The Arabic Word “Euclides” means “key to geometry” was probably mistranslated to a Greek author “Euclid” and text as “Elements” after Arab transfer of translations of earlier knowledge to Byzantium.